Facing his old enemy the Ottoman fleet, the Greek fleet was of little weight. Too weak in 1821-29, it was still weak in 1866-68, and during the first crisis of the Balkans in 1885. In 1897 during the war of Thessaly, it was reinforced and now enjoyed the advantage of the canal of Corinth, a cyclopean trench cut from the rock, inaugurated in 1893. The Turkish navy this time did not intervene, as its own state of disrepair condemned it to inaction. 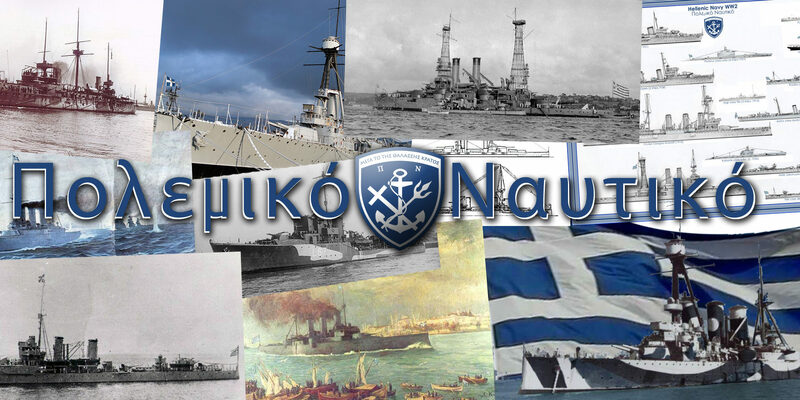 With the help of the Europeans, the Greek fleet was considerably reinforced in 1906, France doing a large part of it. From 1911, foreign consultants were employed and the British were preferred for the navy, shaping it. 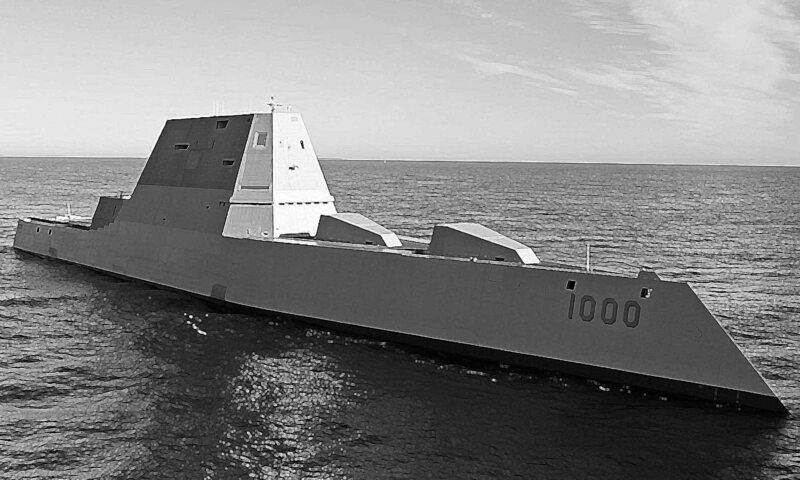 The navy thus became considerably stronger as tensions in the Balkans became more acute. So it was the millionaire Giogios Averoff who provately ordered and purchased a powerful ship in Italy on behalf of the Navy (a rare feat in the annals of navies), which gave the Greeks a serious asset against any potential opponent. Meanwhile the three Hydra-class cruisers were rearmed, 6 destroyers were acquired, 2 submersibles and 6 torpedo boats started, 9 cargo freighters were converted into auxiliary cruisers. During the first Balkan war, Admiral Kondouriotis was forced to lead an active defense against the Dardanelles, and to support the troops fighting the Turks in Epirus. Another squadron commanded by Damianos attempted a landing against the Preveza forts in the Gulf of Arta. On October 21, 1912 Kondouriotis’ fleet invaded the island of Lemnos, commanding the entrance of the Dardanelles. Other islands of the Aegean Sea were thus occupied without opposition on the part of the Turks. The Greeks in particular transported the troops of their Bulgarian allies to Thrace and supported them, but the December 3rd armistice with Bulgaria and the other Balkan states allowed Turkey to extend its forces to the Straits. A meeting took place that lasted 40 minutes but was indecisive. Other meetings were held without convincing results (see “the Balkan war”). An ambitious program, with the order of construction at the Vulkan shipyards of a 20,000-ton dreadnought, the Salamis, but also two other battleships (finally bought in the US) and two twins at the Averoff was started, but the armistice May 1913 put an end to its developments. The head of the British Naval Mission became the Director of the Greek Naval Staff, Sir Mark Kerr, and defined a new plan consisting of 3 light cruisers, 34 destroyers, 20 submersibles, 2 airships, 12 seaplanes and naval vessels. support. 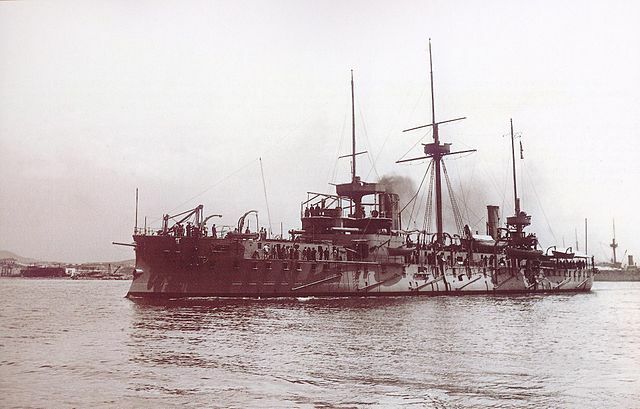 With the new Turkish ambitions and the purchase of the Rio for the Brazilians then under construction, a new emergency plan on the eve of the war included two 23,000-ton dreadnoughts, 1 cruiser, 4 destroyers and a submarine. 5 Battleships: 2 class Kilkis (1905, purchased in the USA in June 1914), and three battlecruisers class Hydra (1889). Project: Dreadnought Salamis commissioned in Germany in 1913, launched in November 1914, but whose construction was stopped in December 1914 due to constant design changes of its sponsors. It was never completed and demolished in 1932 after a long trial. 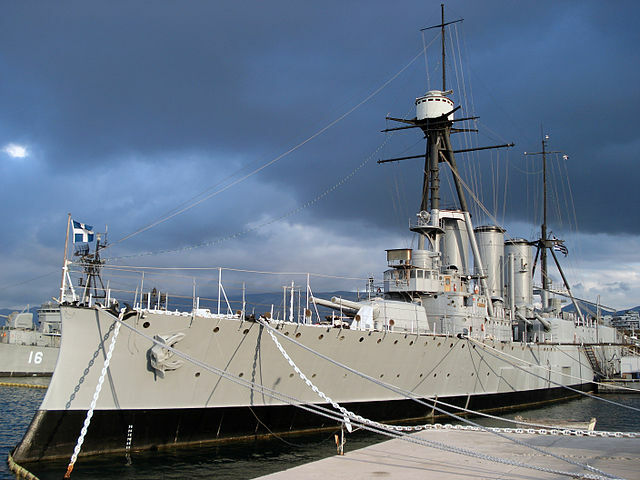 3 Cruisers: Battleship cruiser Giorgios Averof (1910), cruiser Helle (1913), and old Nauarchos Miaoulis (1879). In 1914 he served as a training ship for gunners. 14 Destroyers: 4 class Niki (1906), 4 class Thyella (1906), 4 class Aetos (1911), 2 class Keravnos (purchased from the Germans 1912). 11 Raiders: 6 modern Class Aigli (German Constituency, 1912), 5 class NF11 (1885). 20 Miscellaneous: 2 submersibles Delfin class (France, 1911), Mine moorings: Tenedos (1906), 3 class Aigialeia (1881). 4 Gunboats class Achelaos (1884), 2 class Ambrakia (1881), 2 class Kissa (1884), 3 class Alfa (1880), 2 class Plixavra (1858), training ship Basilissa Olga. Planned: dreadnought battleships Salamis, Basileus Konstantinos, Katsonis class cruisers. With the beginning of the war in August 1914, it became clear that dreadnoughts started in Germany and France would never see the light of day. The government, through the voice of the naval minister Sir Mark Kerr, tried to get the British to finance a Valiant-type battleship, and a Southampton cruiser, with a deferred payment at the end of the war, without success. Left neutral at the beginning of the Great War, Greece was constantly solicited by Churcill to assist the Royal Navy and the French Navy, even while Bulgaria was on his side, against the Tuque fleet to open the dardanelles the second expected front. But internal political disturbances between a pro-German faction in the court of Constantine I and sympathizers of the Allied cause led to a forcing of the French who unceremoniously seized the entire Greek fleet on October 19, 1916. The legions passed under the French flag and control while the heavy units saw their crew reduced to little. Giorgio Averoff, now preserved at Pireus. After the disembarkation of the French troops at Salonica and aided by a fringe of the population hostile to the Monarchy, a provisional government was established, and the internal disturbances helped by the allied army made Alexander I to leave his throne, abdicating in favor of his son Georges II. On July 2, 1917, Greece entered the war against the triple alliance, lending its ports to allied ships. With the surrender of Turkey in 1918, the Greek government saw the means of appropriating landless important plots of the Ottoman Empire. On May 15, 1919, the fleet deployed and Greek troops landed in minor Asia, seizing Western Anatolia and Izmir. The Treaty of Sèvres in 1920 confirmed the possession acquired in the Aegean Sea, but the Turkish counter-offensive finally forced the Greeks to leave Turkey at the end of 1922. Conway’s all the worlds fighting ships 1860-1905 and 1906-1921.